Duke belongs to Mill Valley couple Carl Keane and Chieko Strange. He is the couple's third Cavalier King Charles, and the second one named Duke. "He's 4 years old and is on the large side for a Cavalier… we say he is 'big-boned,' " laughs Carl. "He likes his treats and periodically he might get some raw organic ground beef from Whole Foods… because he's a Mill Valley dog! He is a professional sleeper, although we do walk around Stolte Grove a lot." Duke sometimes sleeps in a crate in the living room. "We call it his condo," says Carl. "He likes to go in to for privacy, but mostly he likes to perch himself on a pile of throw pillows high up so he can see what's going on – in particular he can view the kitchen and see if anyone is in there that he can shame into giving him a treat." When we lived in San Francisco we used to see a Cavalier and its owner walking in Jackson Square. My wife and I turned to each other and said, "we have to get one." After much research we got Duke the 1st, and then John Milton. They had to be put down within six months of one another and we were crushed; the house was lonely and too quiet. So, after a year of mourning, we reached out to the same breeder in Texas and got the Duke of North Ferndale. 2. What is Duke’s favorite snack? He loves dried Icelandic cod treats. 3. Does he have any favorite trails? He loves walking downtown Mill Valley and then we do the first flight of the Dipsea Steps. 4. Does he sleep in your bed? Yes, he sleeps at the foot of the bed and exactly at 5 a.m. he comes and pushes my head off the pillow and sleeps above me. (Ironically, Duke the 1st and Milton did the same thing! So weird). 5. What’s the origin of the name Duke? I grew up surfing; I used to live in Hawaii. Named after Duke Kahanamoku. 6. Tell us something unique about Duke. He likes to watch the 49ers! 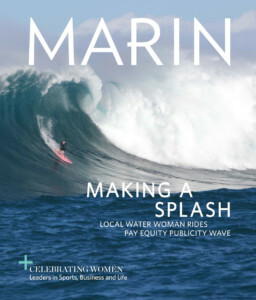 If you'd like to enter your dog into Marin's dog-of-the-month, please contact jessica@marinmagazine.com.